During summer, I feel like most of us get so preoccupied with protecting our skin from the sun that it’s easy forget about protecting our hair. That’s right: the sun can take a toll on the health of your hair, whether or not its color-treated. But especially as someone who’s rocking fun color in my hair, sun protection for hair has been on my brain lately! UVA and UVB rays can damage the hair in several ways, such as causing dryness, breakage, split ends, and discoloration. It can fade color treated hair and make your hair feel straw-like. If you use the right products while styling, though, you can easily make sure that your hair stays healthy while you have fun in the sun. 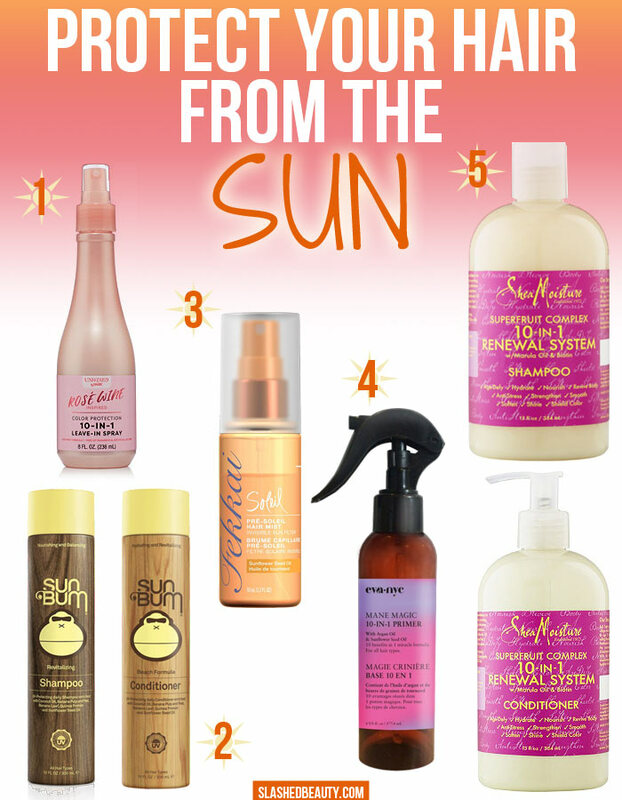 Keep reading to discover budget-friendly sun protecting hair products. Click the picture of the product to find it online. I personally use this the most when I’m heat styling or spending a day in the sun. This one is specifically for color-treated hair and offers UV and thermal protection. It also helps detangle hair, eliminate frizz, mend split ends and adds shine. It is, in fact, infused with rose wine and has a slight sparkling fruit scent. I’ve been spending a lot of time outdoors whether I’m chilling by the pool or going on a hike, and I always make sure to apply this in advance. I’ve experienced minimal fading of my freshly purple hair, with this in part to thank! If you want an easy way to incorporate sun protection into your routine, just start using a shampoo and conditioner that offers those benefits! The Sun Bum Beach Formula Daily Shampoo and Conditioner is made with nutrient-rich quinoa protein, coconut oil, bananas and sunflower seed oil to help nourish and moisturize, while essential vitamins and antioxidants prevent damage, dullness and discoloration from the sun. This duo is also vegan, silicone free, SLS free and gluten free. This salon-quality spray adds dramatic shine to your hair along with a UV filter that acts like a shield on your hair. Use it before sun exposure and throughout the day to refresh and prolong protection. It’s made with sunflower seed oil and prevents your hair from becoming parch or faded. This should be the last step in your hair styling routine, after you have used any heat tools and you’re ready to step outside. This all-in-one styling primer is perfect when you’re looking to streamline your routine and protect your hair. Not only does it protect against thermal, environmental and UV damage, but it also detangles, strengthens, softens and cuts drying time! Argan oil helps add shine and keeps frizz away while also protecting against heat tools. Meanwhile, it’s super lightweight so you won’t be left with a greasy or crunchy feeling. If you have thick or coarse hair, this one’s for you. The Shea Moisture Superfruit Complex Shampoo and Conditioner https://rstyle.me/n/c6m7fpbpah7 helps stop the effect of UV exposure and other environmental damage in its tracks. This is great for making coarse hair feel more smooth and manageable. I would choose this one over the Sun Bum duo if your thick hair is already damaged and you need to help repair as well as protect. If all else fails, be sure to wear hats or scarves when out in the sun to minimize damage to your hair. How do you protect your hair from the sun? Let me know in the comments below. And now, for the best blog posts of the week from The Lipstick League. Beautygeeks – dedicates this post to a contingent of 15 lovely readers from Canada and the US who colluded to surprise our Manigeek with a full set of a recently-released nail polish collection when her samples went astray. Blushing Noir – Have you seen the NARS Nordstrom Anniversary Sale EXCLUSIVE makeup collection yet? The Eyeshadow Palette is TO DIE FOR and the lip sets are a force to be reckoned with. My Beauty Bunny – has a HUGE international makeup giveaway going on right now! All you need is 30 seconds to enter! Phyrra – I’m finally sharing my shopping secrets! Here’s 10 must have beauty products for travel. They’ll make your travel beauty routine so much easier! we heart this – Considering microblading? These are the things you need to know and the before and after photos you NEED to see! Beautygeeks is Currently Craving: Atelier Cologne Bois Blonde, a crisp gender-neutral cologne absolue with blond woods, incense, orange flower and vetiver that gets along wonderfully with her tricky body chemistry. It’ll be the third she acquires from what’s become her favourite house of fragrance.